The CSB translation, and its predecessor, the Holman Christian Standard Bible, (HCSB), have their roots in the Southern Baptist tradition, but do not let that stop you, if you are not Southern Baptist. Both Bibles are published by the Holman Bible Publishers, which is part of Lifeway Christian Resources, the book publishing arm of the Southern Baptist Convention. If you are outside of Baptist circles, you might not know much about where the CSB and HCSB came from. The CSB and HCSB have roots back in the development of the New King James Version (NKJV) of the Bible (1982). The NKJV was designed to update the language of the venerable King James Version (KJV), along with a modest attempt to bring in more contemporary scholarship. Those who envisioned the HCSB, completed in 2004, believed that a successor to the NKJV was needed, applying more of the latest scholarship, along with greater attention to rapid changes in the English language. The HCSB, though primarily popular in Southern Baptist circles, did make the effort to include a wider, interdenominational team of scholars. That same basic approach can be found in the CSB, shedding the not-as-familiar Holman name, in an effort to appeal to a larger Christian audience, beyond the Baptist world. The ESV, known as the English Standard Version, is probably still my “go-to” translation, with the NIV 2011 not too far behind, but the CSB is right up there, too. By far, the above Holman book is my favorite apologetics commentary on the Bible, though it only covers the Gospels and Acts. However, the CSB Apologetics Study Bible, being focused on here, is a more user-friendly book, designed for use by someone new to Christian apologetics. Now, I am a “Bible geek,” so take what I say here with a grain of salt: As far as this particular printing of the CSB goes, with the publication of The CSB Apologetics Study Bible, I am generally pleased with it, but I do confess to having a few mixed thoughts. A little background context will help. 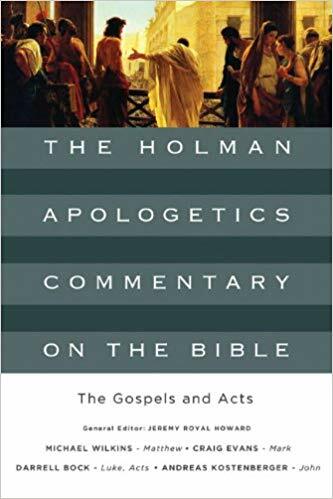 I have been spoiled by the most excellent Holman Apologetics Commentary on the Bible: The Gospels and Acts, by the same publisher. That commentary on the Gospels and Acts is more academic than your average study Bible, but the content is so absolutely superb and thorough, addressing just about every New Testament challenge you can think of, and even more, that I am not sure how anything could top it! That book came out in 2013, so I have been waiting and waiting for the commentary on the rest of the Bible to come out. I was hoping that The CSB Apologetics Study Bible would be that book, but this volume does not quite get there (though it is still quite good). Though my personal expectations were not met, I do not mean to discourage potential readers on this new apologetics study Bible, as it does have some wonderful features. Allow me to explain. 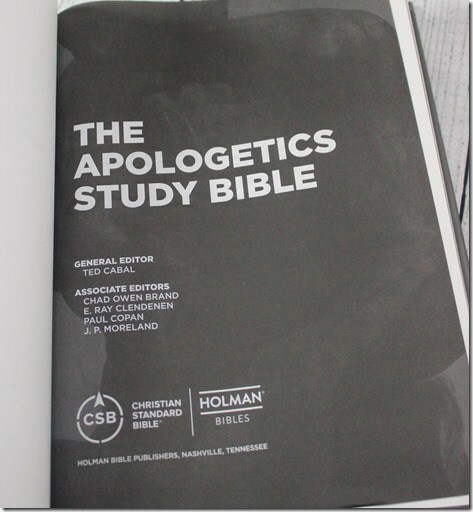 The CSB Apologetics Study Bible is really designed for the Christian who is completely new to Christian apologetics. If the thought of doing Christian “apologetics” sounds scary to you, but you know in the back of your mind that it is still important, then this is the study Bible for you. In a rapidly changing culture, doing Christian apologetics is no longer optional, as you simply can not assume that the average person shares much of the same worldview perspectives that most Christians historically have had. The CSB Apologetics Study Bible is a wonderful tool for enabling the Christian to engage thoughtfully with the belief systems of others, without being intimidating. If even that still scares you, you should know that Sean McDowell, son of the well-known Christian apologist, Josh McDowell, revised this study Bible, for use by young people. The CSB Apologetics Study Bible for Students is basically a slimmed down version of the larger study Bible. This would make a great gift for a high school graduate. We just bought a copy for a niece, who is heading off to college this fall. Aside from getting the CSB translation, perhaps the greatest benefit of The CSB Apologetics Study Bible is the generous wealth of apologetics articles spread throughout the text, and at the beginning and end of the Bible. Topics ranging from “How Apologetics Changed My Life!,” to “Has the Bible Been Accurately Copied Down Through the Centuries?,” to “Is God a Male?” give a fantastic, broad richness to the text. The authors are some of the best names in Christian apologetics, including Josh McDowell, Sean McDowell, Walter Kaiser, Norman Geisler, Ravi Zacharias, Paul Copan, and J. P. Moreland. General editor Ted Cabal put together a very broad team of scholars to address common objections to the Christian faith. When I get involved in apologetics-type of conversations, particularly with non-believers, I can easily get overwhelmed, if my interlocutor knows more about the subject than I do. But neither you nor I have to know everything. Simply having a one-stop reference tool handy, like the CSB Apologetics Study Bible, can help any Christian get up to speed on practically any discussion, particularly for the basics. The next best thing about The CSB Apologetics Study Bible are these little sections called “Twisted Scripture Notes” scattered throughout the Bible. Do you want to know how the Mormons read Genesis 1:26-27 differently from historically orthodox Christians? Well, you have a succinctly written note that explains this. That being said, I must confess some of my disappointments. First, while many of the apologetics articles are quite good, the quality is not always even. The articles all do a great job in explaining the apologetics issues involved, in certain passages of the Bible. That feature alone is a good enough reason for having this study Bible! However, there were times where the essay authors sought to argue for a particular point of view, that did not seem necessary, nor was it always clear. For example, the notes fairly discuss the differences between Young and Old Earth Creationism, without picking sides on the debate. However, the notes tend to vacillate regarding the role of evolution in creation, in some notes flatly ruling out “evolution,” without much further explanation (Is this “evolution” as biological theory, micro or macro?, or “evolution” in terms of a materialist, philosophical worldview? ), while in other notes allowing for a possibility (sort of, maybe… maybe not?) for some form of evolution as a Christian option. Not having a clear definition of “evolution” may confuse some readers. Likewise, in the CSB Apologetics Study Bible for Students, the timeline outline for the exodus from Egypt clearly favors the early-date for the Hebrew’s escape from Egypt, in the 15th century before Christ, while some of the notes embedded in the text merely hint at the late-date proposal, in the 13th century, with little explanation. So while the apologetics articles and embedded notes make for great talking points in evangelistic conversations, there are limitations. Regarding the problem of large numbers in the Old Testament, the notes in the regular CSB Apologetics Study Bible recognize the difficulty of translating the Hebrew word “eleph,” which is typically, though not always, translated as “thousand.” But then the notes proceed to hold to the traditional view of 2 to 4 million Israelites, crossing the Sinai wilderness, without adequately addressing the textual interpretation problems involved in maintaining that position. But at least the issue gets discussed there, as the CSB Apologetics Study Bible for Students is strangely silent about the topic. The thought of several million people, wandering the Sinai desert, without leaving an archaeological trace, might be a stumbling block for a knowledgeable high school or college student. Every now and then, I could spot out a few minor errors, as when an article on “Evolution” in the CSB Apologetics Study Bible for Students, mistakenly suggests that Emma Darwin, Charles Darwin’s wife, was “an evangelical Christian.” Actually, Emma Darwin held to a belief in Unitarianism, and you would be hard pressed to find an evangelical today who would agree that Unitarianism is compatible with historic, evangelical theology. 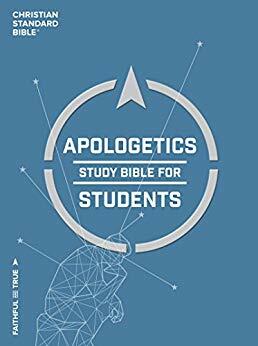 One short, positive plug for the CSB Apologetics Study Bible for Students is that, unlike its “adult” counterpart, the Student version has several dozen of these brief “Bones & Dirt Notes,” that describe archaeological discoveries that help to confirm the historical character of the Bible. This is really cool. This all might be a bit too nit picky for the average Bible reader, so your mileage might vary. If you simply want a general background in Christian apologetics, with a modest amount of detail, these apologetics study Bibles, either the main version, or the student version, serve their purpose well. But if you are still scratching your head after reading some of the detailed articles, you will need to consult outside sources to get your answers. 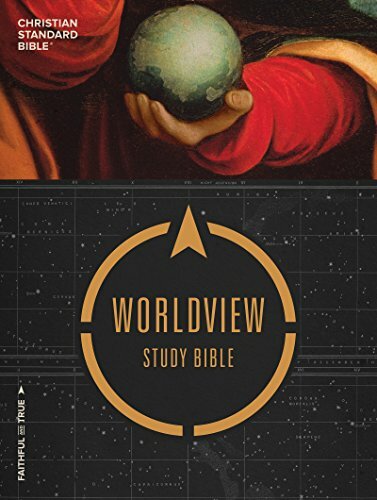 The CSB Worldview Study Bible, for those who want a “big picture” approach to Christian apologetics. Let me briefly toss in another option, just to keep in mind: Another possible alternative to the CSB Apologetics Study Bible, that takes an even broader look at contemporary apologetics issues, without getting too far down into the weeds, is the CSB Worldview Study Bible, released in 2018. 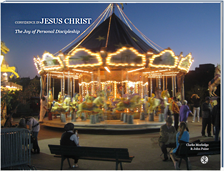 You can find a sampler of the CSB Worldview Study Bible here. I have not explored the Worldview edition, but it might be really good for folks who simply want the “big picture,” when it comes to Christian apologetics. Finally, I need to address some issues with the Kindle edition of the CSB Apologetics Study Bible , that I have. In my experience, a lot of study Bibles for Kindle have some annoying problems. For example, in the CSB Apologetics Study Bible, the biblical text does not have hyperlinks to the study notes. You have to scroll down to the end of the chapter to read the notes, which can be painful for long chapters. One quirky “feature” of the Kindle version is that there is a whole set of pages, near the beginning of the book, simply listing the page numbers of the Bible, hyperlinked, where you can jump to the page you want. This is nice, but it is a really odd “feature,” since Kindle already has a page number finder system built into the ebook program. But for some odd reason, the Kindle version of this study Bible does not use this built-in system. I like Kindle books, mainly because, they do not take up book shelf space, and they are generally much cheaper than either hardback or paperback. On the other hand, there is just something about the look and feel of having a physical book in your hands, that a digital version can not emulate. For that reason, the CSB Apologetics Study Bible for Students we got for a niece is a paperback. Overall, The CSB Apologetics Study Bible (or its Student version) is a good study Bible… just not as good as it could have been. But then, I am picky. Alas, it could be just that I want a more thorough apologetics commentary, which would just make the Bible really, really huge, and probably unwieldy. So, I could just be asking for too much. But if you are really new to Christian apologetics, then The CSB Apologetics Study Bible , or the Student version, for young people, would be an excellent place to start. Curious to know more? You should take 5-minutes to view this video by Sean McDowell, that shows how important and necessary it is to be better prepared to have answers, for your faith, particularly for young people. This entry was posted on Tuesday, August 21st, 2018 at 7:05 pm	and tagged with apologetics, christian standard bible, holman christian standard bible and posted in Apologetics. You can follow any responses to this entry through the RSS 2.0 feed.